Instant downloads of all 942 LitChart PDFs (including It). Welcome to the LitCharts study guide on Stephen King's It. Created by the original team behind SparkNotes, LitCharts are the world's best literature guides. A concise biography of Stephen King plus historical and literary context for It. A quick-reference summary: It on a single page. In-depth summary and analysis of every Chapter of It. Visual theme-tracking, too. Explanations, analysis, and visualizations of It's themes. 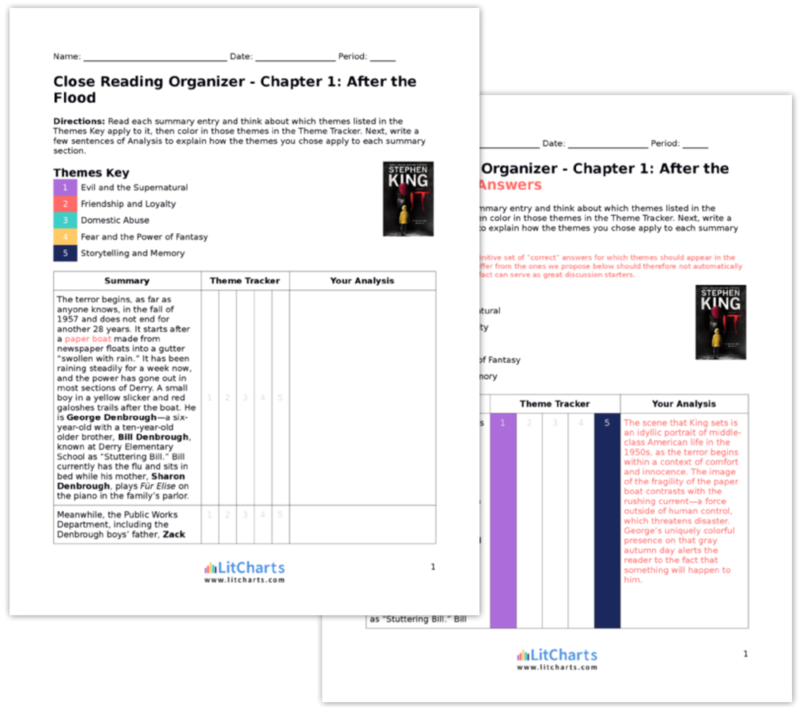 It's important quotes, sortable by theme, character, or Chapter. Description, analysis, and timelines for It's characters. Explanations of It's symbols, and tracking of where they appear. An interactive data visualization of It's plot and themes. Stephen King was born to Donald and Nellie Ruth Pillsbury King. His parents separated when he was a toddler, causing him and his older brother, David, to bounce between Fort Wayne, Indiana, where his paternal family lived, and Stratford, Connecticut before settling in Durham, Maine. King began writing when he was six or seven and was heavily influenced by comic books and movies. King graduated from high school in 1966, then went on to the University of Maine at Orono. While there, he wrote a column for the school newspaper and participated in anti-war protests. King was dismissed from the draft due to physical ailments that made him unfit for service. In 1970, he earned a B.A. in English, with a qualification to teach high school. Around this time, he met his wife, Tabitha Spruce, at a university library and they married in January 1971. Tabitha King is also a writer of suspense novels. King worked menial jobs before securing a position as a high school English teacher in the fall of 1971. He sold his first short story to a men’s magazine in the same year and continued to write stories in the evenings. He also began to work on his first novels. Carrie was the first to be published in 1974, after he secured a contract with Doubleday. King is known as one of the most prolific and popular American authors of the twentieth-century. His novels have been adapted for numerous successful films and television series. One of these, The Shining, is based on his own struggles with alcoholism as well as his family’s brief sojourn at a hotel in Boulder, Colorado. King still resides in rural Maine, where many of his novels and short stories are set. He and Tabitha have three children: Naomi Rachel, the novelist Joe Hill, and Owen Philip, as well as four grandchildren. 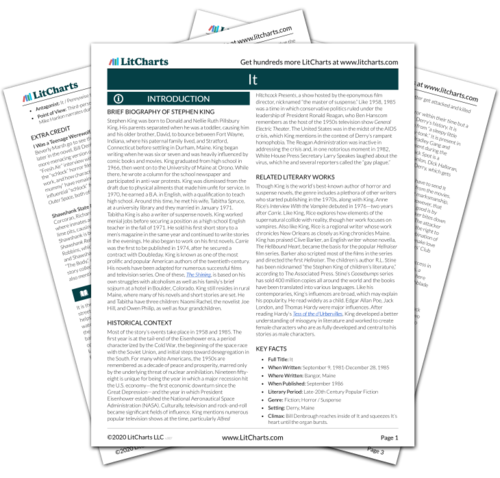 Get the entire It LitChart as a printable PDF. Though King is the world’s best-known author of horror and suspense novels, the genre includes a plethora of other writers who started publishing in the 1970s, along with King. Anne Rice’s Interview With the Vampire debuted in 1976—two years after Carrie. Like King, Rice explores how elements of the supernatural collide with reality, though her work focuses on vampires. Also like King, Rice is a regional writer whose work chronicles New Orleans as closely as King chronicles Maine. King has praised Clive Barker, an English writer whose novella, The Hellbound Heart, became the basis for the popular Hellraiser film series. Barker also scripted most of the films in the series and directed the first Hellraiser. The children’s author R.L. Stine has been nicknamed “the Stephen King of children’s literature,” according to The Associated Press. Stine’s Goosebumps series has sold 400 million copies all around the world and the books have been translated into various languages. Like his contemporaries, King’s influences are broad, which may explain his popularity. He read widely as a child. Edgar Allan Poe, Jack London, and Thomas Hardy were major influences. After reading Hardy’s Tess of the d'Urbervilles, King developed a better understanding of misogyny in literature and worked to create female characters who are as fully developed and central to his stories as male characters. Climax: Bill Denbrough reaches inside of It and squeezes It’s heart until the organ bursts. I Was a Teenage Werewolf. Richie Tozier, Ben Hanscom, and Beverly Marsh go to see this film at the Aladdin Theater and, later in the novel, Bill Denbrough and Richie are chased by a more menacing version of the cinematic werewolf. During a “Fresh Air” interview with Terry Gross, King talked about how the “schlock” horror films of the 1950s have influenced his work, and how characters such as “the werewolf” and “the mummy” have remained fixtures in his imagination. Other influential “schlock” films include The Fly and It Came From Outer Space, both of which are also mentioned in the novel. Sutton, Mary. "It." LitCharts. LitCharts LLC, 20 Sep 2018. Web. 11 Dec 2018. Sutton, Mary. "It." LitCharts LLC, September 20, 2018. Retrieved December 11, 2018. https://www.litcharts.com/lit/it.